Strategic planning can be both exciting and intimidating for participants new to the process. The idea of “strategy” sounds exotic and important, and while much of this work is less than exotic, it is absolutely critical. Having a solid understanding of strategy will help you to prepare to engage with others in your company on assessing and refining your firm’s strategic goals. The essence of strategy is about choosing where to invest, whom to serve, and how to compete and win. 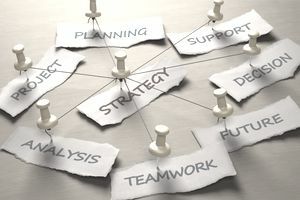 From George Day’s classic definition: “Strategy is a series of integrated actions in pursuit of competitive action,” to Jack Welch’s overly simplistic: “You pick a direction and implement like heck,” strategy is about choosing where to apply your firm’s resources to successfully serve a particular audience. When considering competitors, some say that strategy is about using force against weakness. Strategy is not just a list of financial targets. Financial results are outcomes of actions taken to execute on a strategy. Growth is not a strategy. Firm leaders sometimes use "strategy" incorrectly when making general statements about their firm. For example, the statement “our strategy is expected to grow 10 percent per year” does not articulate a firm's strategy. Strategy is not about the budget. It is used to define and prioritize the investments needed to carry out a plan. A budget is a detailed listing of the timing and total amount of planned expenditures and revenues. Strategy is not an event. It is a dynamic process demanding constant evaluation and regular refinement based on lessons learned in the marketplace. Many firms relegate strategy work to an occasional off-site or planning session. Strategy is not a tactical operations “To-Do” list. While a result of any strategy process is a series of coordinated actions, they must focus on serving customers, opening new markets and developing competitive strengths, not listing operational improvements. Too many firms fall into the trap of applying template-type approaches to strategy development. A common and ineffective template suggests that the firm review the mission, define a future vision, and then describe the actions necessary to realize that vision. While all of those topics have merit at the right time, the application of this template-type process yields little meaningful strategy content. Based on this work, the team must assess which investments to make and what actions to take to realize the strategy. This includes evaluating investment options; initiating new projects; and identifying key requirements for talent, systems, and supporting resources. These actions are then distilled into a project plan that describes the firm’s strategy execution plan and process. While defining an effective strategy appears to be fairly straightforward, identifying meaningful and accessible opportunities and determining how to realize those opportunities in a competitive or demanding marketplace is a difficult process. Strategic planning demands an objective evaluation of the firm’s capabilities and ample debate over the best way to realize the opportunities. Like most activities in life, the more thorough the planning, the better the outcome. In the case of strategy, planning is a messy process of ideas, opinions, and egos that must give way to a cogent and agreed-upon plan in pursuit of serving customers and outperforming competitors. Implementing the actions described and establishing measures of progress and financial targets are key to what is described as the execution process. A healthy execution program recognizes the need for widespread, clear communication and coordination, and incorporates the tools of project management to support implementation and reporting. Additionally, an effective strategy execution process incorporates feedback loops to reflect and adjust for lessons learned in the marketplace. An invitation to participate in defining the future direction of your firm is a compliment and a testament to your supervisor's belief in your knowledge and ability to contribute to the strategy process. With experience, you can develop into a critical thinker and great strategist.